Consider this is the first New Orleans related post leading up to Mardi Gras (as part of our annual month-long Fat Tuesday lead up series). 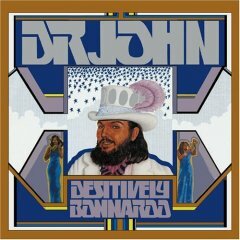 This album is one of my favorites in the Dr. John oeuvre. Laissez les bons temps rouler. I have but one ritual when I visit the Amoeba music, on Sunset Blvd, that I rarely ever forget to practice; nothing too hoodoo either, just a walk to the back of the store, to the New Orleans department, and a quick thumb through the Dr. John section, both vinyl and CD, for a copy of the good doctor’s 1974 LP Desitively Bonnaroo. Notoriously and consistently in and out of print (what’s up with that, anyway? ), the album just drips with the funk. Backed by The Meters and produced by Allen Toussaint, Desitively Bonnaroo is something like the nasty older sister of the Doctor’s In The Right Place LP which boasted the same home team of players and producer. Not one to miss. Note: The below cover of “(Everybody Wanna Get Rich) Rite Away” is off Robert Walter’s Money Shot LP, a collaboration with Galactic’s Stanton Moore on drums. If you ever have the opportunity, catch Walters’ band live. They kill. Further Reading: For those looking to get their nails a little dirty, I cannot recommend enough the Dr. John biography Under a Hoodoo Moon : The Life of the Night Tripper. Did they ever get around to remastering any of Dr. John’s early albums besides “Gris Gris”? I’m a fan and have a whole mess of his records (including a set of “Dr. John teaches piano” instructional cassettes, which aren’t terribly instructive but quite fun to listen to), but some of the mixes and mastering jobs are abhorrent. I played this album non-stop in college.